One of the most iconic sci-fi characters ever has returned in her thirteenth incarnation for all-new adventures across space and time. Exploring the universe in her time-travelling TARDIS, sonic screwdriver in hand, the Thirteenth Doctor is ready to sort right from wrong and save civilisations throughout the galaxy. Highly detailed 10”/26cm fully articulated, collectible figure comes dressed in real fabric high-waisted culottes, rainbow striped black shirt and lilac coat. 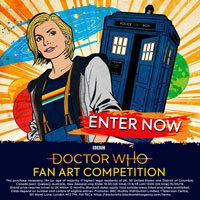 The figure also carries her essential Sonic Screwdriver accessory. For ages 5 years and over. 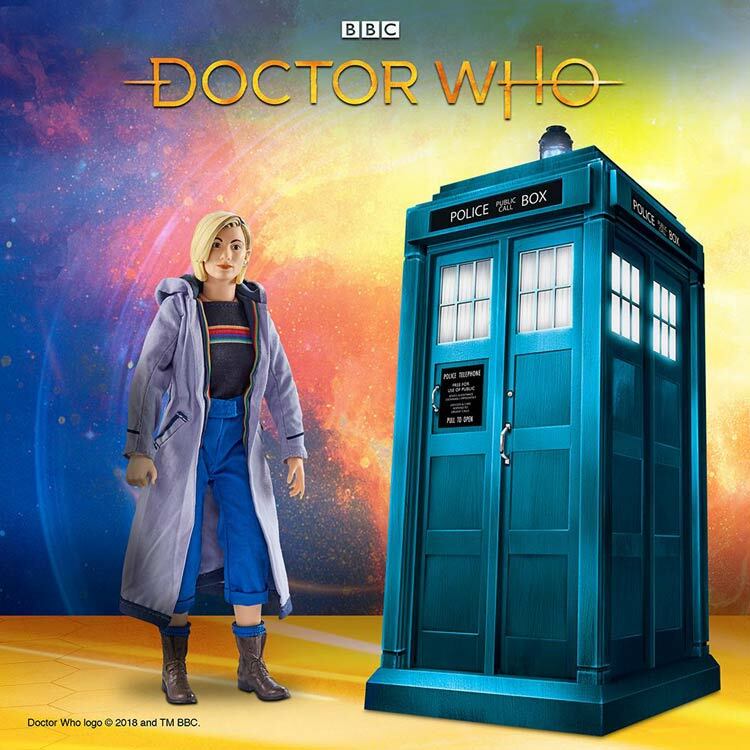 Character Options is delighted to unveil its brand new Doctor Who figure, the first 10” figure of the Thirteenth Doctor, played by Jodie Whittaker. The new, highly detailed 10”/26cm fully articulated, collectible figure comes dressed inreal fabric high-waisted culottes, rainbow striped dark blue shirt and coat. The figure also comes with the Doctor’sessential Sonic Screwdriver accessory. I know I seem dumb, but my friend confused me about this, does shipping mean it’s on its way? Oh. It’s only because I got a shipping email from CO saying it has been shipped. 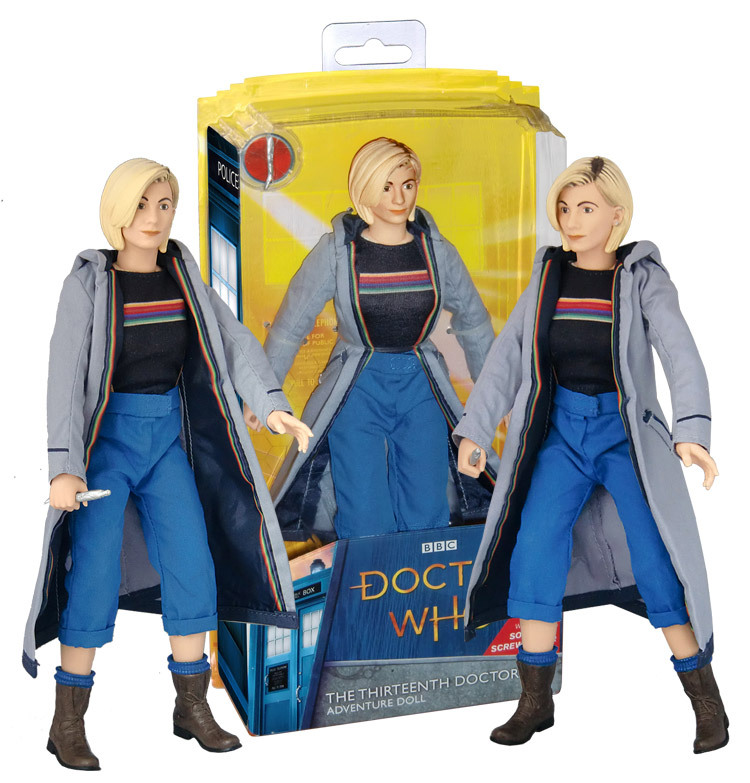 Not sure if it has been mentioned already, but I see Argos are now listing the 13th doctor doll and new sonic screwdriver on their website. I have pre ordered and have heard nothing :/ Hope it arrives soon! 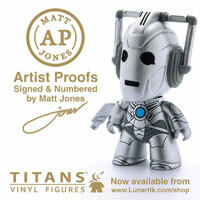 Forbidden Planet have just changed their expected in warehouse date to 30th August. Completely astounded by this. Should never have even pre-ordered it in the first place. Release dates getting postponed comes very closely to being my biggest pet hate. I purchased the figure a couple of weeks ago and on the order details it stated the item should have been arriving today however I was sceptical about that considering these comments and having no email stating it had been dispatched. The 13th Doctor figure won’t be arriving today and will just be somewhere in the next 1 – 4 weeks. No date specified. Was told by Amazon 1 – 4 weeks. It’s alright though. It’s rather a shame no one seems to know when it’s actually being released. the stock must have arrived though for character to send theirs out, suspect the stock didn’t quite get to the warehouse on time and the 1-4 weeks is default. Was told an hour ago that the item isn’t available from there suppliers but have been told 1 – 4 weeks. Maybe it’s first to market for charactor online? I messaged character about the figure a couple of weeks ago before the item was on Amazon because I wanted to know if they’d get more stock. I was told that they’re sure they’ll get further stock. I hope that’s the case for them even though I have no idea when mine will be dispatched. I’m thinking by the end of August well have it. Amazon just told me they haven’t got it in yet. Now will be sent off between 10th and 25th August. Someone on another website who ordered from Amazon says his is being delivered today. Just got the email from CO confirming that mine has been dispatched! Hooray! Thinking Charactor Options will release there’s first and then Amazon. I live in Australia and pre-ordered from Character. I’ve had two emails and the last yesterday (AUS date 31/7 at 9:45 pm) saying it has shipped. No tracking which is disappointing but I would expect to have it here in 5-7 work days based on shipping cost. So interesting to see if I get it before those on Amazon in the UK. Think now I made the right choice going with the company directly. Ooh, someone on Twitter just posted a pic of their figure saying it arrived not long ago. They are out in the wild! did they say where they got it? 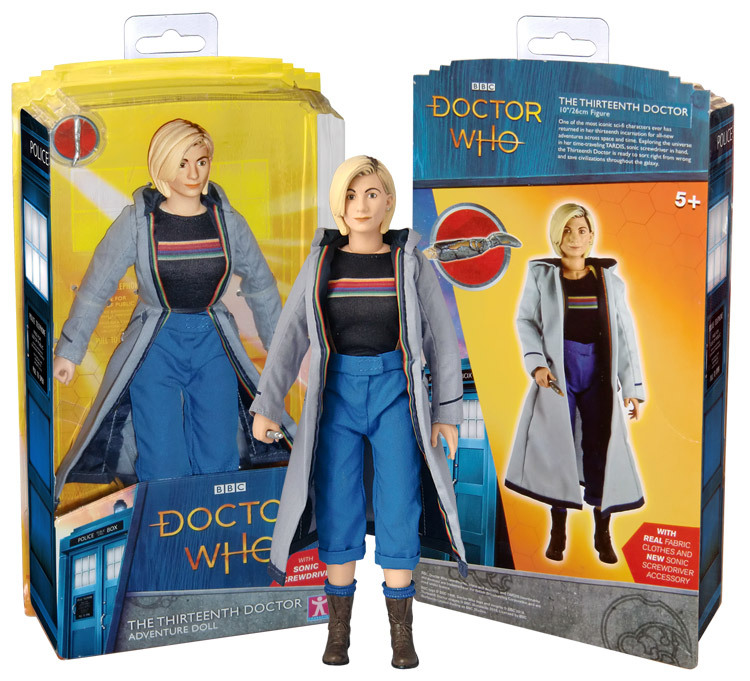 Worlds apart also have the 13th Doctor 10 inch figure too! This is a bit random, but does anyone know why the classic figures just randomly stopped at silver nemesis Ace? Were they cancelled for a reason? they were a joint venture between Character and what was Underground toys back then, I believe sales in the USA become poor and the UK market wasn’t big enough to carry on, the last sets were sold of very cheaply by FP so clearly they just struggled to sell. Apparently The Figure and Screwdriver have been delayed until Wednesday. Sent an email to CO this morning. Haven’t had a reply yet. If they have delayed the dispatch again, I shall be cancelling. This isn’t good enough. Exceedingly poor customer service. They should have updated us on Friday if there was a delay in dispatch instead of leaving us with no clue as to what’s happening. Same thing happened to me. I tried calling them this morning like booboo suggested but no answer. Sent 4 emails, no response…. booboo, have you had any news? Not sure my previous comment got through… can anyone tell me what’s happening with dispatch for this figure from Character Options? I tried emailing representatives but they all have automatic response enabled and are mysteriously “on vacation” until next week. This figure was supposed to be dispatched yesterday. What is going on?? I have also been worried. it turns out that the customer service department closes at 2:30 on Fridays and don’t open again until Monday morning, so they will not be any help. Cheers mate! Stay safe from the heat! Even more worried now that I can’t even get onto the website. Anyone else having a problem? their https certificate has probably been overlooked, common issue. @Pjd94 Yeah, not working on this side of the pond either I’m afraid. @booboo Thanks booboo! I suspect as well. I’m really upset though, the figure was announced on my b-day and I managed to snag one of the last ones. My brother said that the July 23rd shipping date was too good to be true… but in the email they sent they sort of confirmed that they were going to ship by latest July 27th… booboo do you think it’s more worth it to just order one from Amazon at this point? When do you expect CO will ship? Monday? Sounds like a plan, thanks booboo! Some browsers may be blocking it because the security certificate hasn’t been renewed (I got that message yesterday), but once the website added as an exception, it works correctly on Firefox at least. This is the question everyone is asking. If so, then yes it should be the same face sculpt, but we have to be patient. I doubt we will see any announcement until September at the very earliest. 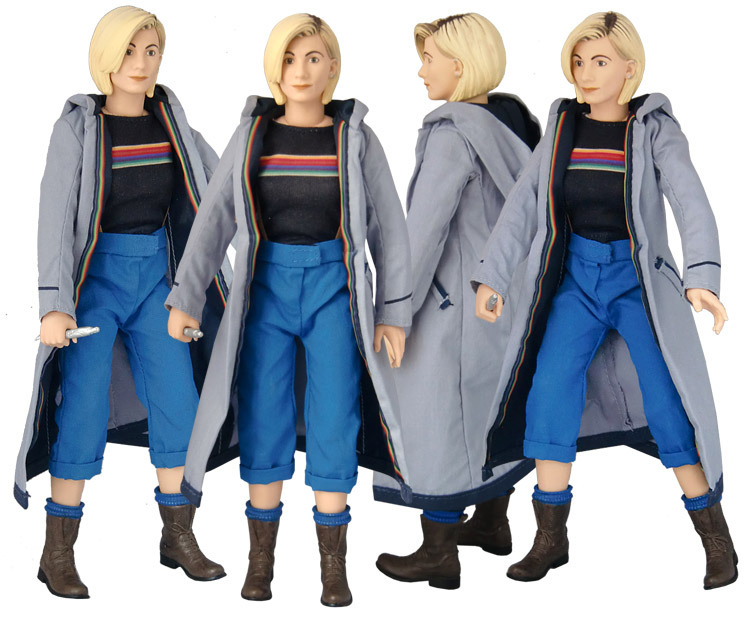 Seven20 is making a 5.5″ figure for the 13th Doctor. It will be exclusive to Toot’s Toys. Does anyone know which FP of FPI is cheaper when it comes to postage? Fp.com will charge £5 (approx) for an order over £20 (approx) no matter what other items you add to the order. I think fpi charge extra shipping per item. So if you’re just ordering 1 item then got for fpi. Although they usually take a lot longer to dispatch. Oops, my bad, postage from galaxy 4 is only £3! Great job with the “closer look” article, booboo. 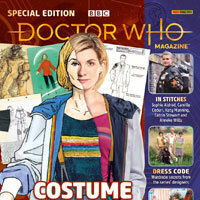 Very interesting to see all the different images and poses (hood off, jacket off etc.) Really appreciated! Oh, and as stetson doctor says, thanks for the new photos boo boo. This is my first toy in years and the photos made me feel even happier about getting it. It really is a good likeness of her. 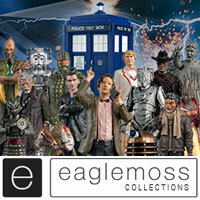 My local toymaster are getting a delivery from Character on Tuesday and say the new Doctor Who stuff should be included!!! Should we take this as an indication that other UK high street stores, or maybe even supermarkets, will soon be taking on this line of Doctor Who products? Theres a toymaster in my town, that hasen’t stocked Doctor who merch since the first 11th sonic and tardis playsets (they never even got the series 5 figures in) However there was a Lazlo figure going for about £1.99 (still in box) available in the reduced section up until like 2015. Could this mean the entire chain of Toymaster is now interested again? Each Toymaster is independent. My local toy shop is technically called Youing’s Toy Box but it’s under the Toymaster umberella. Interesting that neither this doll nor the CO 13ths sonic feature in forbidden planet’s top 5 sellers scoreboard on their homepage. 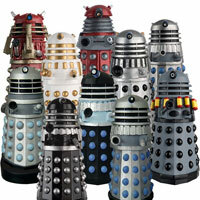 Previous preorders on Dr Who merchandise have shot straight to the top. Early sales figures and preorder numbers will give valuable information not only to shops and manufacturers of products but also the bbc as to how well the show is doing (or going to do). The Amy in police uniform Pop! is currently #4. Saying that, the 13th Doctor Sonic is a number 1 seller on Amazon. Quite good for a toy from a Series of a show that hasn’t aired yet. There’s no reason why it may not be right. It may just not have been as popular. Bare in mind the SDCC Pops dominate the top of the list, exclusives that were inevitably going to sell well. What Booboo is saying is that the list can’t be right, not because there are things above the Who stuff, but because the Sonic isn’t in the Top 5 products, while the Amy pop is #4, but on the side bar of this site, the Sonic is before the Amy pop which means the Sonic must be a higher seller than the Amy pop yet isn’t on the list. Sorry if I’m being stupid, where is the Sonic higher than the Amy Pop? 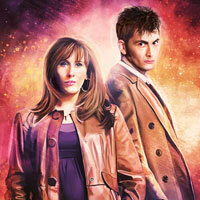 And are you also talking about Forbidden Planet International? The slideshow in the centre isn’t the order of best sellers but showcases the newest products, the order and products on there are different to the Top 5 List. The Top 5 List has always been pretty accurate in the past I don’t see why it wouldn’t be this time. No, the sideshow here, on the Doctor Who Site, under the What’s New bar. 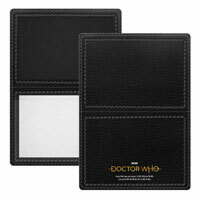 It shows the highest selling Doctor Who products from FP.co.uk. I was referring to the highest sellers scoreboard on fp dot co dot uk, what’s interesting on fp dot com is how heavily featured the doll and CO sonic is on the homepage. I actually feel they might be holding back announcing the 5.5” 13th Dr figure until they’ve reached sales targets on the doll and sonic. They know loads of us are waiting to buy the 5.5” figure and the longer we wait the more likely we are to order the doll and sonic. It’s very clever marketing really, get rid of the ‘slower’ sellers first. I doubt that is the case. I mean, I wouldn’t think the Sonic Screwdriver toy replica would be a ‘slower’ seller, I’d think a lot more people buy the Sonics than the figures, though don’t quote me on that. Besides, I’m personally not gonna order the Sonic until the figure/s and Electronic TARDIS are put up, then I’m ordering them in one go to save on postage and assuming others are like me, then they would be losing a few sales. Thousands more figures are sold than sonics and now we’ve seen the far superior Se7en20 sonic, the CO version might just flop! I can honestly see the doll and sonic being reduced to half price before the years out. 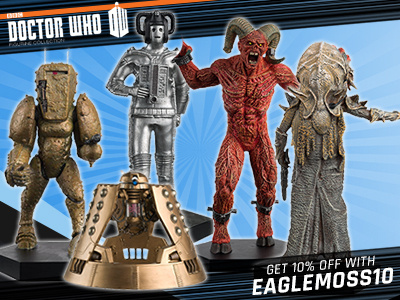 Any figures and Tardis sets will always sell well (as will Daleks) unless there’s something better on offer from the USA? CO will sell at least 10,000 of these if not more, willing to bet, they couldn’t sell 4000 Missy’s which were sold of half price in end. Figures are no longer a mass market big seller, sonics still are and its clear the doll is aimed mostly at a previously non existent market, i could actually see it outselling a 5.5″ figure. Sonics are the number 1 cosplay item which is far more popular that people think. Just remember CO have invested vast sums of money in this license and creating merchandise and they’ve got to sell loads of it just to break even. The bbc casting a lady in the traditionally male role has only added to the ‘gamble’. It’s going to be very interesting to see what happens. Given the investment from toy manufacturers, they will definitely be keeping an eye on fan forums like this site and staying in touch with sellers like fp to see how things are going. Character generally need to make a minimum of 2 variants for high production cost figure to make them viable. This is a great product. The likeness is spot on, the clothes don’t look to big and baggy. But I’ll wait for the BCS figure. I’m happy to save the money and spend big when it’s something like that. This is grwat for the general market. 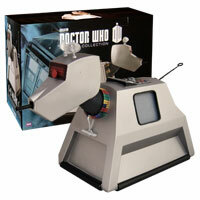 Hoping Smyths Toys start stocking the new merch as it would be great to see Doctor Who on the highstreet shelves again. The only problem is that these retailers need to be convinced of the potential of the gender neutral toy market and that will be a tricky job. Retailers, along with the less open-minded parents, believe in strong separation between which toys are suitable for their children. I currently own the 11th Doctor from Series 7b, a weeping angel and most recently the 10th Doctor. I cannot fault them at all. I also have Sherlock and Watson, which again i think are fantastic collector pieces. 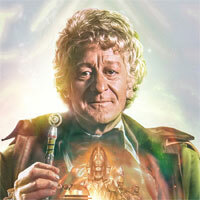 I wanted the War Doctor, but form the promo images was put off by the likeness. I’m not saying BCS are perfect, but they are great collector pieces. I can’t get enough of them. So you think we’ll see anything else from SDCC? I really want this! I hope they reveal the 5.5inch one soon! Odd not to release them at the same time. Back in 2006, we had 12inch novice hame and Martha before their 5inch counterparts! Are there the yellow braces? comments in the news are pretty tame compared to most of social media to be honest.